SOLD. 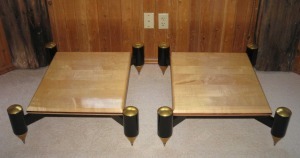 Pair of Rix Rax Outpost Amplifier Stands with 2″ solid maple top shelf, Cocobolo inlay, custom automotive paint (Audi Brilliant Black). Original retail $2250 each. $2400 for the pair, plus shipping, or best offer. 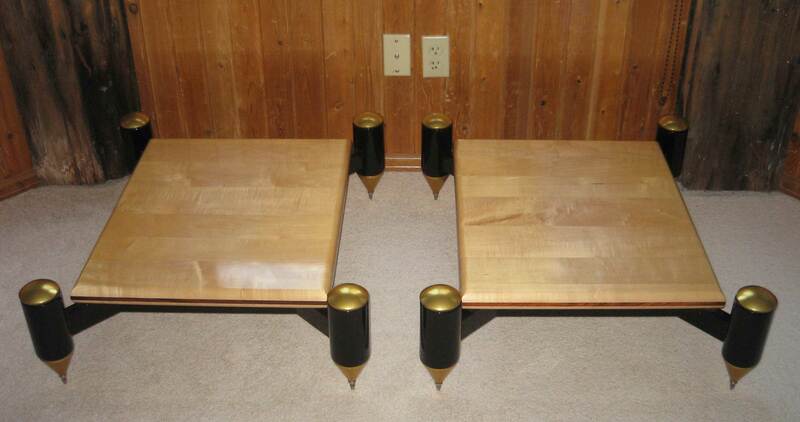 A beautiful and effective way to support your amplifiers. Top shelf dimensions 20″ w x 24″ deep. Overall dimensions 30″ x 26″ x 9.5″ tall. Extremely robust construction. Condition 8/10. Fillable, and we suggest that you do fill them with sand (or well-mixed sand and lead shot). We’ve been liking aquarium sand lately. Spiked, can and should be leveled. Will ship by freight carrier in the original crate. 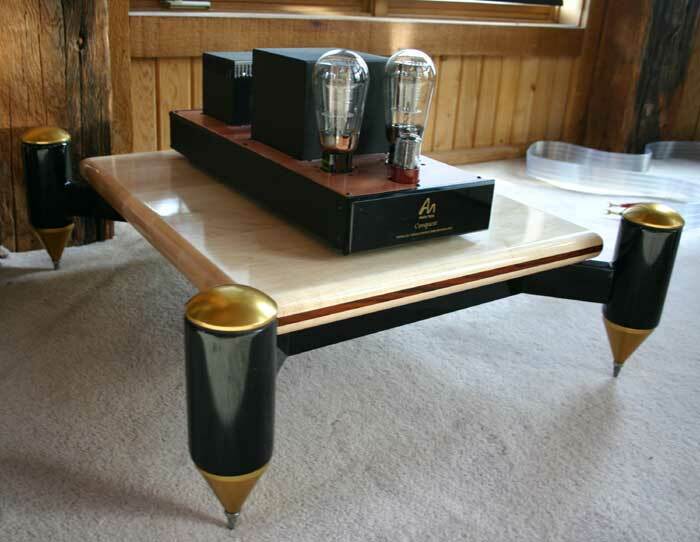 No, the Audio Note Conquest Silver Signature amplifier in the picture is not included with the ampstand :-). 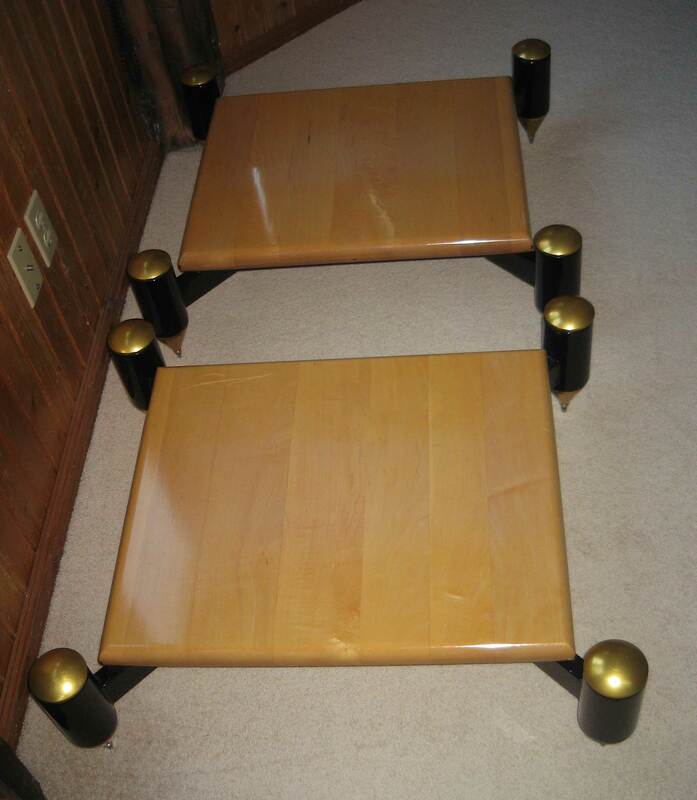 Have more questions about Rix Rax, or about these beautiful and distinctive amplifier stands? Send Neli an email (neli@audiofederation.com) or give a call: 303.546.6503. As you all probably know by now, Rix Rax decided to sell direct a little while ago. To that end I finally got around to removing it from the lists of products we carry here scattered through the little website of ours. which has some photos we have collected over the years of these beautiful equipment racks. For those in search of an attractive, do-no-harm style rack (that can support, for example, HRS M3 vibration control platforms under the components as funds allow), we recommend you consider Rix Rax as a viable solution. So, the Rocky Moun’tane Audio Festivities are soon to begin – well a couple of weeks seems like ‘soon’ to me. We will be in our usual two rooms: 9030 and 9026. One big and one small [medium size seems just not the d’rigor for show hotels]. We’ll have photos of the XDS 1 and Gaku Ons before the show – both here and in Spintricity.